Hayes & Yeading United will be ruing some sloppy defending either side of half time which took an otherwise even match out of their reach leaving Eastbourne Borough's Liam Enver-Marum with a match winning hat-trick. United in fact had the best of a first half in which Eastbourne were restricted to just two chances, both of which ended with the ball in the net. In the 18th minute, Enver-Marum headed in Marc Pullan's free kick but was penalised for a push on Adam Green. However, when the same player nipped in behind Matt Ruby when goalkeeper Michael Jordan's long punt up pitch wasn't dealt with, he managed to head home for a legitimate goal just before half time. 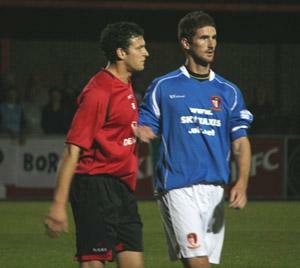 By then, United had gone close through Sean Canham's header from Esmond James's corner and Justin Cochrane had a long shot which Jordan got down to well.James Mulley headed goalwards from Jordan's weak punch but the young keeper was able to recover the ball and Cochrane tried his luck again from long range only for Pullan to block his volley. Even between the Eastbourne goal and half time, James Mulley went close with a volley through a crowded penalty area but the ball flew inches past the post. Just eleven minutes into the second half, the game was all of a sudden taken away from United with two more instances of hesitant defending. First, Tom Cadmore was caught in possession by Enver-Marum and the striker ran through before shooting past an exposed Simon Overland. Then, the same player collected a throw in unmarked before firing into the corner of the net. United continued to press forward afterwards, but those two goals really did end the game as a contest. 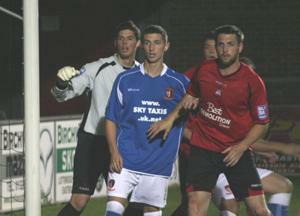 Sean Canham continued to work hard throughout and he flicked a Danny Allen-Page free kick just wide of the post. Then Green hit two rasping drives from outside the box in quick succession but Jordan produced some fine saves to keep them out. Enver-Marum hit the bar with a header from Neil Jenkins's free kick but Eastbourne generally seemed content with their lead. Just after Dale Binns hit a volley inches over, United finally got some reward for their endeavours as George Daly slid the ball throguh to Sean Canham and he rounded Jordan before rolling the ball into an empty net. It was to prove just a consolation, although Cadmore went close with a long range shot, and at the other end, Simon Weatherstone hit a far post volley straight at Overland. The game had been decided by three lapses of concentration in the United defence, and Eastbourne (Liam Enver-Marum in particular) had taken full advantage.